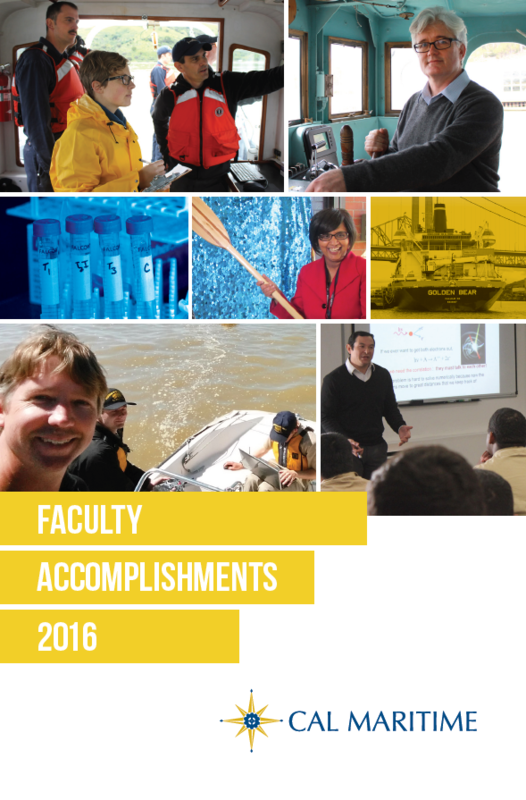 Browse the booklet of faculty publications and presentations from the 2015-2016 academic year. Bachkar, K. (2015). Risk assessment for the security of the global container supply chain: A case study. Proceedings of the Journal of Management and Engineering Integration. Iddrisu, A., Zhang, J., Osmani, A., Bachkar, K., Malm, J., & Yakubu, M. (2015). Financial hedging and sustainability modeling considering uncertainties: A case study of ethanol supply chain. Journal of Management and Sustainability, 5(2), 1. Bachkar, K. (2016, February). Copula-based ethanol hedging for renewable energy supply chains with uncertain corn feedstock and ethanol end-product prices: A case study of ethanol supply chain. Presented at the 28th Annual Consortium of Supply Chain and Operations Management (CSUPOM), San Francisco, CA. Bachkar, K. (2016, March). Assessing the impact of the sea level rise on California’s ports: Case of Oakland. Presented at the 22nd International Annual Conference on Industry, Engineering, and Management Systems (IEMS), Cocoa Beach, Florida. Bachkar, K. (2016, March). Business talents supply: Towards bridging the gap between industry and academia. Presented at the 22nd International Annual Conference on Industry, Engineering, and Management Systems (IEMS), Cocoa Beach, Florida. Bachkar, K. (2016, March). Humanitarian logistics: Meeting the challenge of aligning U.S. national interest with humanitarian interest. Presented at the 21st International Annual Conference on Industry, Engineering, and Management Systems (IEMS), Cocoa Beach, Florida. Bachkar, K. (2016, March). Modeling the decision policy for availability and procurement of ethanol rail cars using dynamic programming. Presented at the 22nd International Annual Conference on Industry, Engineering, and Management Systems (IEMS), Cocoa Beach, Florida. Bachkar, K. (2016, March). Risk and uncertainty in global supply chain logistics: An overview and research agenda. Presented at the 21st International Annual Conference on Industry, Engineering, and Management Systems (IEMS), Cocoa Beach, Florida. Bachkar, K. (2016, March). Risk assessment for the security of the global container supply chain: A case study. Presented at the 21st International Annual Conference on Industry, Engineering, and Management Systems (IEMS), Cocoa Beach, Florida. Bachkar, K. (2016, March). Understanding business programs. Presented at the 2015 Bay Area Share Learn Connect, California State University Maritime Academy, Vallejo, CA. Berkana-Wycoff, P., & Nincic, D. (2015). Foundations of leadership development: Teaching practices that instill leadership of the self. Proceedings of the 16th Annual General Assembly of the International Association of Maritime Universities, Opatija, Croatia. Chisholm, J. (2015). A fault of one's own: A search for stability in the Santa Cruz Mountains. Presented at the Association for the Study of Literature and the Environment Conference (ASLE), Moscow, Idaho. Urban, J. J. & Coates, N. E. (2016). New design rules for polymer-based thermoelectric nanocomposites. In T. Poehler, & H. Katz (Eds. ), Innovative thermoelectric materials, London: Imperial College Press. Cho, E-S., Coates, N. E., Forster, J. D., Ruminski, A. M., Russ, B., Sahu, A., Su, N. C., Yang, F., Urban, J. J. (2015). Engineering synergy: Energy and mass transport in hybrid nanomaterials. Adv. Mater. 27(38):5744-52. Liu, J., Wang, X-J., Li, D., Coates, N. E., Segalman, R. A., Cahill, D. G. (2015).Thermal conductivity and elastic constants of PEDOT:PSS with high electrical conductivity. Macro. 48, 585-591. Heyman, J. N., Sahu, A., Coates, N. E., Ehmann, B., Urban, J. J. (2015). Carrier lifetime enhancement in a tellurium nanowire/PEDOT:PSS nanocomposite by sulfur passivation. MRS Proc. 1742. Coates, N., Liu, J., Segalman, R., Urban, J. (2015, March). Enhanced electrical conductivity due to morphological changes in polyanaline-titania core-shell nanocomposites. Presented at Meeting of the American Physical Society, San Antonio, TX. Coates, N. (2016, January). Solution-processed nanocomposites for better neutron detectors and thermoelectrics. Presented at CSU East Bay Physics Seminar Series. Dewey, C. (2015). [Review of the book Seeing the Eliphant: A Maine couple's adventures in Gold Rush San Francisco, by Martin, K. R.]. Sea History, 151, 52-53. Dewey, C. (2015). [Review of the book The Irish poet and the natural world: An anthology of verse in English from the Tudors to the Romantics, by Carpenter, A., & Collins, L. (Eds.)]. Journal of Ecocriticism, 7(1), 1-19. Dewey, C., Parker, A. E., & Runyon, S. (2016). We know ocean! — Improving ‘ocean literacy' at Cal Maritime. Sea History, 154, 30-33. Dewey, C. (2015, May). Educating the ‘complete mariner’ in an age of technology. Presented at the Nautical Institute (UK) Annual General Meeting and Command Seminar, San Francisco, California. Dewey, C. (2015, September). ‘By guess or by god’ A discussion of Nathaniel Philbrick’s In the Heart of the Sea. Presented at the 2015 Common Reading Lecture presented by the Cal Maritime Library. Dewey, C. (2015, October). Tall tales: Litquake on the water. Presented at the Public forum celebrating recent maritime literature; Co-presented by San Francisco National Maritime Historical Park and Cal Maritime, San Francisco, CA. Parker, A.E., Runyon, S., & Dewey, C. (2015, February). Ocean literacy at California Maritime Academy: Ballast water and environmental protection. Presented at Pearls of Power Conference, Vallejo, CA. Cortes, B. (Producer), Knowles, D. (Director), & Dewey, C. (Performer). (2015). Paths that shine: Nantucket and the Essex [Motion picture]. USA: Courtyard Films. Hanson, M. (2015). Video magic: Student filmmaking with GoPros. 2015 Proceedings of LOEX Conference, Denver, CO, May 1, 2015. Hanson, M. (2016, in press). Review of Metropolitan Museum of Art's Open Access for Scholarly Content (OSAC) and New York Public Library Public Domain Collection. Public Services Quarterly, 12 (2). Hanson, M., & Adams, A.L. (2015, December 16). Say what? Exploring "The most interesting place in the city" – the comments section of online news articles. In the Library with the Lead Pipe. Hartman, B., Clott, C., & Lyday, M. (2015, October). Transportation, jobs, and social networks. Proceedings of I-NUF 2015 METRANS Conference, Long Beach, CA, October 20-23, 2015. Clott, C. & Hartman, B. (2015). Supply chain integration, landside operations and port accessibility in Metropolitan Chicago. Proceedings of I-NUF 2015 METRANS Conference, Long Beach, CA, October 20-23, 2015. Clott, C. & Hartman, B. (2015). Supply chain integration, landside operations and port accessibility in metropolitan Chicago. Journal of Transportation Geography, 51, 131-139. Hartman, L. (2015, September). Indigo mind. Art Exhibit at the StoreFront Lab, San Francisco, CA. September 26 to November 5, 2015. Hartman, L. (2015, September). Traces of the Arctic. Art Exhibit at the Duplex Collective, Portland, OR. September 3-25, 2015. Hartman, L. (2015, October). FiberSHED. Art Exhibit at the Marin Community Center, Novato, CA. October 7, 2015 to January 15, 2016. Hartman, L. (2016, March). My ocean gal. Art Exhibit at the Farmstand, Bolinas, CA. March 7 to April 2, 2016. Higdon, N., Frechette, J., & Williams R. (2015). A vision for transformative civic engagement: The global critical media literacy project. In Huff, M., Roth, A. L., Johnson, N., & Bendib, K. (Eds. ), Censored 2016: Media freedom on the line: The top censored stories and media analysis of 2014-15. New York: Seven Stories Press. Higdon, N. (2015). A vast wasteland: The ongoing reign of junk food news and news abuse. In Huff, M., Roth, A. L., Johnson, N., & Bendib, K. (Eds. ), Censored 2016: Media freedom on the line: The top censored stories and media analysis of 2014-15. New York: Seven Stories Press. Higdon, N. (2015). Critical media literacy and Project Censored. Presented at University of San Francisco. Higdon, N. (2015, November). Censorship in the digital age. Presented at Sonoma State University, Cotati, CA. Higdon, N. (2015, October). Media education and news 2.0: Solutions for the digital generation. Presented at Union for Democratic Communications: Circuits of Struggle Conference, University of Toronto, Toronto, Canada. Higdon, N. (2015, May). Re-inventing media and systems that serve communities and those who live and work there by creating systems that empower potential. Presented at What's Possible Conference, San Francisco, CA. Higdon, N. (2015, April). Global Critical Media Literacy Project. Presented at English Council Of California Two-Year Colleges Conference, San Jose, CA. Higdon, N. (2015, April). Criticizing journalism in the 21st century. Presented at Laney College, Oakland, CA. Higdon, N. (2015, March). Expert educational panel on the drug war. Presented at Students for Sensible Drug Policy Club, University of California, Davis. Steiner, J., *Hendrix, R., *Safreno, A., & Holden, M. (2015, November). A student-run autonomous oceanographic research vessel. Presented at the 23rd Biennial Conference of the Coastal and Estuarine Research Foundation. Kamdar, N., & Lewis, T. (2015). Deriving long-term benefits from short-term study abroad programs. Journal of Management & Engineering Integration, 7, 1-10. Lewis, T., Rao, A., & Kamdar, N. (2015). Employee retention in the maritime industry: A review and analysis. Proceedings of the 16th International Association of Maritime Universities (IAMU) Annual General Assembly Meetings, edited by Boris Pritchard. University of Rijeka, Croatia, May 2015. Kamdar, N. (2016, March). The case of the imposter in the classroom: lessons learned from teaching what I do not know. Presented at the 22nd Annual International Conference on Industry, Engineering and Management Systems, Cocoa Beach. Kamdar, N. (2016, April).Using FLCs to foster and support innovation. Presented at the 2015 IACBE Annual Conference and Assembly Meeting, Baltimore, MD. Kreta, S. (2015). Defining and designing a comprehensive leadership education program using the maritime model of leadership. Proceedings of the 16th Annual General Assembly of the International Association of Maritime Universities. Opatija, Croatia. Givental, E. & Meredith, D. (2016). Environmental and political implications of Vietnam's water vulnerabilities: A multi-scale assessment. Singapore Journal of Tropical Geography, 37(1), 59-75. Meredith, D. & Givental, E. (2016). Hydro-politics and hydro-economics: Comparing upstream and downstream challenges for Vietnam and Ethiopia. Yearbook of the Association of Pacific Coast Geographers, 78. Messer-Bookman, T. (2015). Maritime casualties: Causes and consequences. Atglen, PA: Schiffer Publishing, Ltd.
Metz, J. (2016). STEM education and Bay Area maritime history. Exhibit at the Vallejo Naval and Historical Museum, Summer 2016. Machacek, J.R., Mahapatra, D.P., Schultz, D.R., Ralchenko, Y., Moradmand, A., El Ghazaly, M.A.O., & Chutjian, A. (2015). Solar-wind ion-driven X-ray emission from cometary and planetary atmospheres: Measurements and theoretical predictions of charge–exchange cross-sections and emission spectra for O6+ + H2O, CO, CO2, CH4, N2, NO, N2O, and Ar. The Astrophysical Journal, 809(1), 75. Chutjian, A., El Ghazaly, M.O.A., & Moradmand, A. (2015, July). Measurements and theoretical predictions of charge exchange cross sections and emission spectra for O6+ with H2O, CO, CO2, CH4, N2, NO, N2O and Ar. Presented at the International Conference on Photonic, Electronic and Atomic Collision. Toledo, Spain. Nincic, D. (2015). The continuing challenge of maritime piracy: Will what worked in Somalia work in the new piracy "hot spots"? Proceedings of the 16th Annual General Assembly of the International Association of Maritime Universities. Opatija, Croatia. Berkana-Wycoff, P. & Nincic, D. (2015). Foundations of leadership development: Teaching practices that instill leadership of the self. Proceedings of the 16th Annual General Assembly of the International Association of Maritime Universities, Opatija, Croatia. Nincic, D. (2015, July). Maritime leadership workshop. Presented at the International Association of Maritime Universities Student Forum. Tokyo, Japan. Opp, S. (2015). The role of accreditation in promoting and ensuring quality in higher education in the United States. Presented at the National Bureau for Academic Accreditation and Education Quality Assurance, Kuwait City, Kuwait. Opp, S., Rhodes, T., Boesen, G., Orcutt, B., & Hubert, D. (2015). VALUE: Achieving transformational change in the assessment (and improvement) of student learning outcomes. Presented at the AAC&U Centennial Annual Meeting, Washington, DC. Opp, S., & Donnelly, T. (2015). Lessons learned by a 2013 WSCUC Handbook Group 1 Institution. Presented at WASC Academic Resource Conference, Oakland, CA. Lee, J., Parker, A. E., Wilkerson, F. P. & Dugdale, R. C. (2015). Uptake and inhibition kinetics of nitrogen in Microcystis aeruginosa: results from cultures and field assemblages in the San Francisco Bay Delta, CA. Harmful Algae, 47: 126-140. Wilkerson, F. P., Dugdale, R. C., Parker, A. E., Blaser, S. & Pimenta, A. R. (2015). Nutrient uptake and primary productivity in an urban estuary: using rate measurements to evaluate phytoplankton response to different hydrological and nutrient conditions. Aquatic Ecology, 49(2), 211-233. Dewey, C., Parker, A. E. & Runyon, S. (2016). We know ocean! – improving ocean literacy at Cal Maritime. Sea History, 154: 30-33. Dugdale, R. C., Wilkerson F. P. & Parker, A. E. (2015). The "Ammonium Paradox": A summary of more than a decade of research into phytoplankton processes and nitrogen relationships in the northern San Francisco Estuary. Technical Report for the San Francisco Estuary Institute. Parker, A. E., Ferner, M. C. & Cebellos, E. (2015). Initial recommendations regarding the potential for nutrient impairment of ecosystem health in Suisun Marsh, CA. Report for the San Francisco Regional Water Quality Control Board (Region II). Agreement Number 12-135-250. Parker, A. E. (2016, April). Microcystis blooms in the San Francisco Estuary: The role of nitrogen and phosphorus. Presented at Interagency Ecological Program for the SFE Annual Meeting, Folsom, CA. Parsons, A. (2015). Desire, forgetting, and the future: Walt Whitman's Civil War." Arizona Quarterly: A Journal of American Literature, Culture, and Theory, 71(3). Parsons, A. (2015). [Review of the books A Bold and Hearty Race of Men: The Lives and Literatures of American Whalemen by Schell, J. and Antebellum at Sea: Maritime Fantasies in Nineteenth-Century America by Berger, J.]. Leviathan: A Journal of Melville Studies, 17(2). Parsons, A. (2016, March). Reading the inland sea. Presented at Biennial Conference of C19: The Society of Nineteenth-Century Americanists, State College, PA.
Parsons, A. (2015, November). Thinking right, acting well: Sexuality, race, and reform in nineteenthcentury maritime literature. Presented at 113th Annual Meeting of the Pacific Ancient and Modern Language Association, Portland, OR. Pecota, S., Grabowski, M., & Holder, E. (2015). Augmented reality navigation displays: Maintaining situational awareness in the e-Navigation era. Proceedings of the Marine Safety & Security Council, the Coast Guard Journal of Safety at Sea, 72(2), 52-55. Pecota, S. (2015, February). eNavigation and overreliance on technology. Presented at Ship Operations Cooperative Program Spring Summit, Vallejo, CA. Pecota, S. & Davidson, B. (2015, February). SkySails and Cal Maritime. Presented at Pearls of Power Conference, Vallejo, CA. Pinisetty, D. & Devireddy, R.V. (2016). Microscale thermoelectric devices for use with biosystems. In X. He and J. Bischof (Eds. ), Multiscale technologies for cryomedicine: Implementation from nano to macroscale. Hackensack, NJ: World Scientific Publishing. Shunmugasamy, V.C., Anantharaman, H., Pinisetty, D., & Gupta, N. (2015). Unnotched izod impact characterization of glass hollow particle/vinyl ester syntactic foams. Journal of Composite Materials, 49 (2), 185-197. Pinisetty, D., Shunmugasamy, V. C. & Gupta, N. (2015). Hollow glass microspheres in thermosets. In B. Yalcin, & S. E. Amos (Eds. ), Hollow glass microspheres for plastics, elastomers, and adhesives compounds. Amsterdam, Netherlands: Elsevier. Gupta, N., Luong, D.D. & Pinisetty, D. (2015). Weight saving potential of metal matrix syntactic foams. In N. Gupta and P. K. Rohatgi (Eds. ), Metal matrix syntactic foams. Lancaster, PA: DEStech Publicationss. Pinisetty, D. & Shunmugasamy, V. C. (2016, February). Hollow fly ash composite foams: Thermal mechanical properties. Presented at The Minerals, Metals, and Materials Society 145th Annual Meeting, Nashville, TN. Pohlmann, B. (2016, March). Some properties of acyclic heaps of pieces. Presented at 47th Southeastern International Conference on Combinatorics, Graph Theory & Computing, Boca Raton, FL. Powell, S. (2015). Looking out the window: Training the navigator for the 21st century waterway. Proceedings of the Marine Safety and Security Council, the Coast Guard Journal of Safety at Sea, 72 (2), 58-60. Powell, S. (2015, December). ECDIS updating. Presented at 2015 Deep Draft Industry Day, Sector San Francisco, Coast Guard Island, Alameda, CA. Powell, S. (2015, September). Teaching with technology: An ECDIS pedagogy study. Presented at e-Navigation Underway North America Conference, Throggs Neck, NY. Runyon, S. (2015). A simple and fun demonstration of photon energies and the photoelectric effect. The Chemical Educator, 20, 1. Runyon, S. (2015, March). Assessing and developing ocean literacy as an element of global stewardship in an undergraduate population. Presented at the 18th CSU Symposium on University Teaching, Los Angeles, CA. McPherson, M., Parker, A. E., Dewey, C., Muller, R., & Runyon, S. (2015, February). Ballast water management and the protection of us ocean resources: Finding common ground between science, policy and business stakeholders. Presented at Pearls of Power Conference, Vallejo, CA. Parker, A. E., Runyon, S., & Dewey, C. (2015, February). Ocean literacy at California Maritime Academy: Ballast water and environmental protection. Presented at Pearls of Power Conference, Vallejo, CA. Simons, J., Fauci, L., & R. Cortez. (2015). A fully three-dimensional model of the interaction of driven elastic filaments in a Stokes fluid with applications to sperm motility. Journal of Biomechanics, 48(9), 1639-1651. De Pillis, L., Hood, K., Graham, E.J., Ma, Y., Radunskaya, A., & Simons, J. (2015). Injury-initiated clot formation under flow: a mathematical model with warfarin treatment. Applications of Dynamical Systems in Biology and Medicine: The IMA Volumes in Mathematics and its Applications, 158, 75-98. Simons, J. (2015, October). Sperm motility in populations. Presented at Mathematics Colloquium, University of San Francisco, CA. Simons, J. (2015, August). Sperm motility in 3D: Towards an understanding of swimming in groups. Presented at International Congress on Industrial and Applied Mathematics, Beijing, China. Simons, J. (2015, August ). Free versus fixed: Boundaries in Stokes flow. Presented at International Congress on Industrial and Applied Mathematics, Beijing, China. Simons, J. (2015, July). Sperm motility near surfaces in 3D. Presented at Society for Mathematical Biology Conference, Atlanta, GA.
Simons, J. (2015, March). Sperm motility in 3D. Presented at Scientific Computing Around Louisiana Meeting, New Orleans, LA. Simons, J. (2015, March). Cooperative swimming in viscous environments. Presented at Society for Industrial and Applied Mathematics - Computational Science & Engineering, Salt Lake City, UT. Menssen, A., Trevisan, C. S., Schoeffler, M., Jahnke, T., Bocharova, I., Sturm, F., Gehrken, N., Gaire, B., Gassert, H., Zeller, S., Voigtsberger, J., Kuhlins, A., Gatton, A., Sartor, J., Reedy, D., Nook, C., Berry, B., Zohrabi, M., Kalinin, A., Belkacem, A., Doerner, R., Weber, T., Landers, A., Rescigno, T., McCurdy, C. W., Williams, J. (2016). Molecular frame photoelectron angular distributions for core ionization of ethane, carbon tetrafluoride and 1,1-difluoroethylene. J. Phys. B: At. Mol. Opt. Phys., 49, 055203. Rescigno, T. N., Trevisan, C. S., & McCurdy, C. W. (2015). Tracking hole localization in K -shell and core- valence-excited acetylene photoionization via body-frame photoelectron angular distributions. Phys. Rev. A, 91, 023429. Trevisan, C.S. (2015). Calculation of entrance amplitudes for dissociative electron attachment and detection of core hole localization in x-ray photoionization. Visiting Faculty Program Report, U. S. Department of Energy, Office of Science. Trevisan, C. S. (2015). Can the quantum nature of matter be controlled? Presented at the International Workshop on Life and Matter and Society: Beyond Expectations, Yukawa Institute for Theoretical Physics and the Kyoto University, Kyoto, Japan. Trevisan, C. S., Williams, J. B., Menssen, A. J., Rescigno, T. N., Dorner, R., & McCurdy, C. W. (2015, June). Molecular frame photoelectron angular distributions for core ionization of CF4 and C2H2F2. Presented at the Meeting of the Division of Atomic, Molecular and Optical Physics, Columbus, OH. Trevisan, C. S., McCurdy, C. W., & Rescigno, T.N. (2015). Exploring the Interaction Between Light and Matter: Probing Molecular Geometry and Dissociation Dynamics. Presented at Kyoto University, Kyoto, Japan. Trevisan, C.S. (2015). Peer instruction: An active-learning buddy system. Presented at Kyoto University, Kyoto, Japan. Trevisan, C. S., McCurdy, C. W., & Rescigno, T. N. (2015). Probing molecular geometry, dissociation dynamics, and detection of core hole localization in x-ray photoionization. Presented at the Lawrence Berkeley National Laboratory, Berkeley, CA. Nyinkeu, N. D., Tsuma, C. K., & Ngatchu, H. (2016, in press). A project-based teaching for information technology students in Africa: A case report. International Journal of Technology and Learning. Mlay, S. V., Tsuma , C. K., Sabi, H. M., Langmia, K. (2015). Uncovering reading habits of university students in Uganda: Does ICT matter? International Journal of Education and Development Using Information and Communication Technology , 11(2), 38-50. Sabi, H., Mlay, S., Tsuma, C., & Bang, H. (2015). Conceptualizing user preference and trust in western designed banking software systems in developing countries. Journal of Internet Banking and Commerce, 20(3). Osang, F.B., Nchise, A., & Tsuma, C. (2015). Reviewing information systems usage and performance models. International Journal of Computer Science and Information Technologies, 6 (1), 476-484. Head, A., Van Hoeck, M., & Garson, D. (2015). Lifelong learning in the digital age: A content analysis of recent research on participation. First Monday, 20(2). Van Hoeck, M. (2015, March). What we talk about when we talk about lifelong learning. Presented at Association of College and Research Libraries National Conference, Portland, OR. Van Hoeck, M. (2015, March). The day after graduation: What is workplace information literacy? Presented at Forsyth Technical Community College, Winston-Salem, NC. Branch, N., Dahlen, S., Marines, A., & Van Hoeck, M. (2015, April). Information literacy: A core competency for student academic & post-college success. Presented at WASC Academic Resources Conference, Oakland, CA. Yip, F. L. (2016, May). Single photon double ionization of atomic magnesium. Presented at 47th Annual Meeting of the APS Division of Atomic, Molecular and Optical Physics, Providence, RI. Yip, F. L. (2015, June). Hybrid Gaussian-discrete variable representations for continuum electrons in molecules. Presented at 46th Annual Meeting of the APS Division of Atomic, Molecular and Optical, Columbus, OH. Yip, F. L., McCurdy, C. W., & Rescigno, T.N. (2015, July). Hybrid Gaussian-discrete variable representations for continuum electrons in molecules. Presented at the XXVIV International Conference on Photonic, Electronic and Atomic Collisions (ICPEAC), Toledo, SPAIN. Yip. F. L., Palacios, A., Martin, F., Rescigno, T. N., & McCurdy, C. W. (2015, July). Time-dependent double photon double ionization of atomic beryllium with ultrashort pulses. Presented at the XXVIV International Conference on Photonic, Electronic and Atomic Collisions (ICPEAC). Toledo, SPAIN.